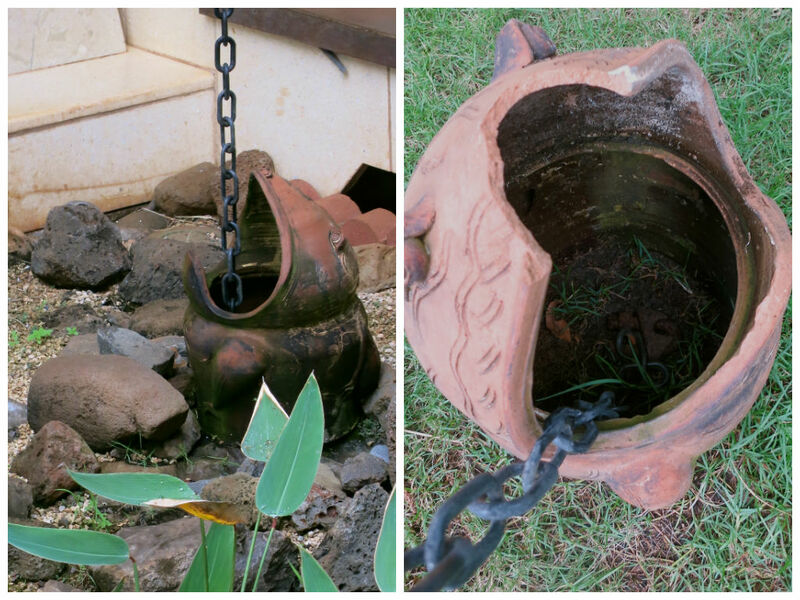 I spotted these unique and practical water catchers at our current digs in Lahaina and thought my gardening friends would be keen to see how they manage rainy days on Maui. This thirsty ceramic frog sits patiently awaiting a cool drink. As rain water trickles down the chain from the eave, it’s gobbled up and runs back into the garden soil. I love that it’s practical, whimsical and artistic too. What do you think? 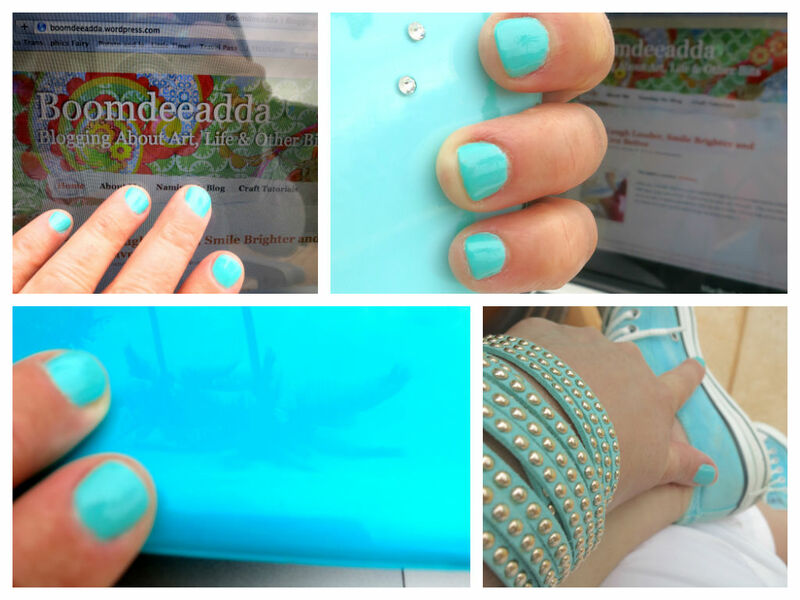 Now, this is how Boomdee managed a rainy day, I got my nails done to match everything I own, LOL ! This includes, but is not limited to; my phone, MAC, sneakers and bracelet. Very Aqualiscious! 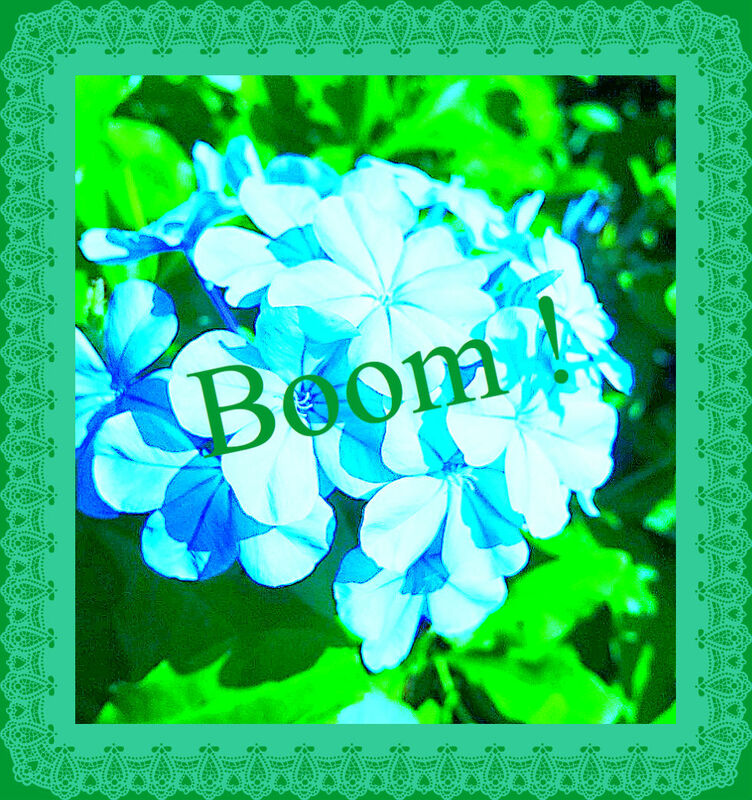 The garden flowers weren’t a perfect match but now they are, BOOM ! 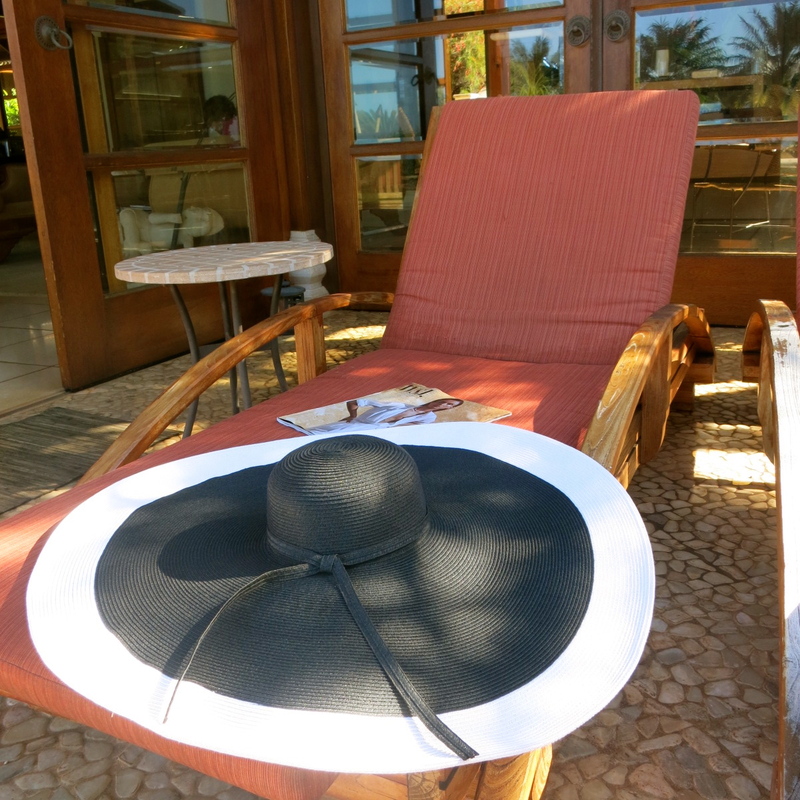 As an optimist would, I bought a new chapeau for the sunnier days at a fab shop in Lahaina called Chapel Hats. It has the biggest brim you’ve ever seen. Made by hand, it folds and rolls quite neatly for travel. It has a UPF of 50+ ! 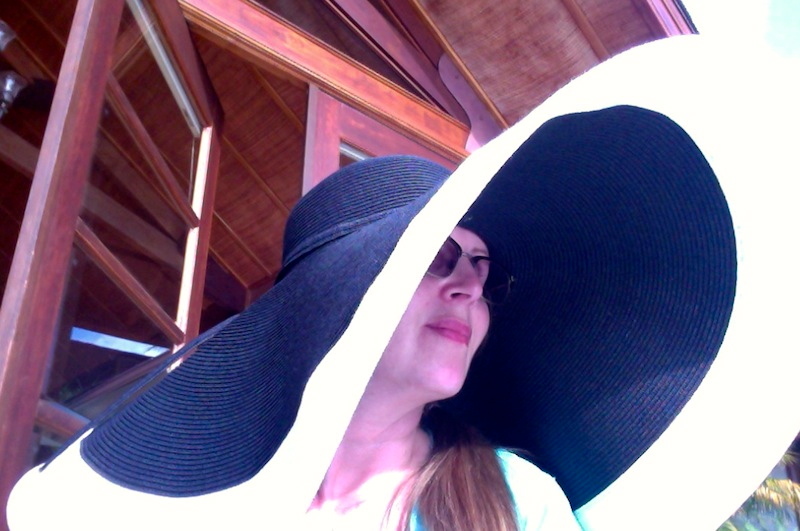 The generous brim can be folded and moulded to suit the many activities of a luxurious holiday.I’d wear it to do a little poolside reading, spy on the neighbours enjoy the tropical beauty all around, walk thru the garden or just sit on the soft green lawn. Sometimes I like to be dramatic though. Maybe I could be a rich socialite having a little secret poolside romance. Or a ‘once-famous’ hollywood actress that’s not been seen in public for years. LOL, I can imagine the locals thought you a bit mad since it rains quite frequently in Vancouver being that they’re on the coast. Good for you to embrace the day, come on back sometime. I’ve usually been there in April and the Apple Blossoms are so so gorgeous. 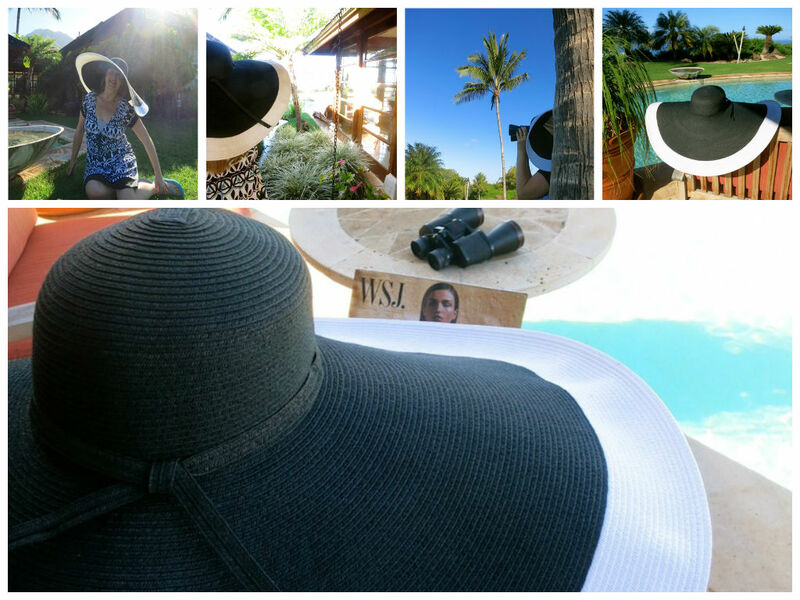 This post is so totally YOU – everything unique and wonderful. We have a drippy gutter I should try that chain thing on – but I’d have to catch the water in a bucket since it’s over the deck. I hope you know I can’t see ANYTHING aqua without thinking of you! But that hat just takes the cake. It could double as a beach umbrella, almost. Thanks for bringing a BIG smile to my day, as you always do! 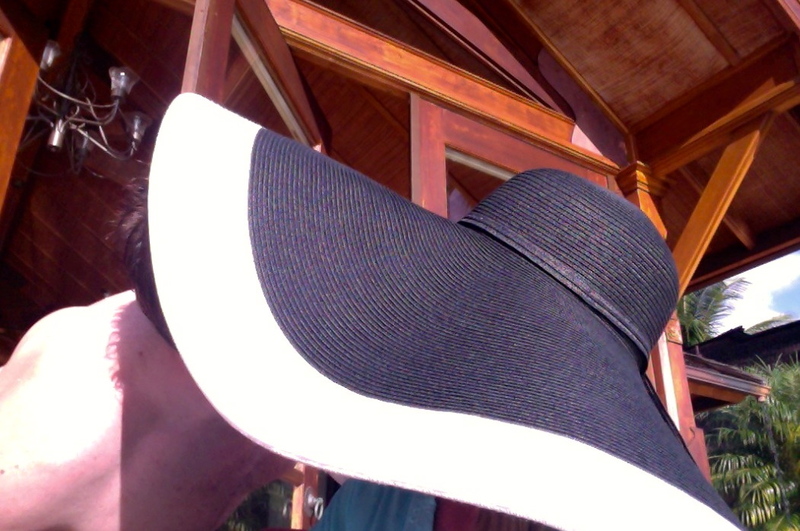 LOL, you know you’ve bought a BIG hat when you have no place to store it at home. I might try and find a standing coat tree for the corner of my room. They had one at the B&B filled with hats you could borrow. They were all different and unique and I kind of really dug that. Almost like a little, ever changing art installation. I love that frog! What a cute idea! Isn’t he clever. I’ve seen a few neat ideas on Pinterest with the water flowing out of the eve trough on the ground but not this. I think it suits the style of the dwelling really well. While they’re an important necessity on homes, I’ve always thought they weren’t attractive at all. 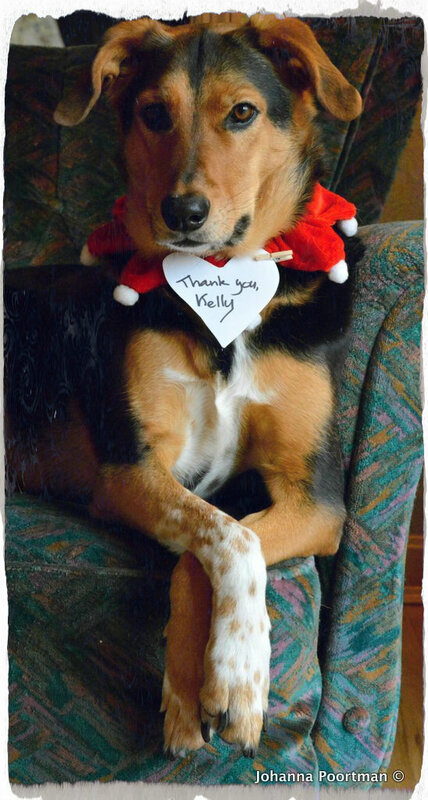 Thanks so much for all your nice messages xox happy days to you! The aqua nails are awesome! Too shy??? I’d be the one snorting while I laugh…yep, it happens HA. I got it home without any problem so you never know where it’ll turn up hehe. I like napping and reading on rainy days too. I was listening to the ocean waves from our balcony in Maui and had a hard time staying awake, very comforting. Love it – the hat, the nails and the once famous movie star who is now a famous blogger. Ha, maybe Warhol was right. I spent my ’15 minutes’ nursing a pineapple and rum cocktail by a pretty pool in Maui…life is good 😀 Thanks so much for popping in, we got home Sunday morning and I’m slowly getting organized again. If I really was a famous blogger I could get my butler to help with laundry, LOL. My MAC has a clear aqua cover that protects the regular chrome finish that it came in. If you have a MAC, stop at your local Apple store for a peak. Otherwise, you could take your laptop to a local store and look into a ‘skin’ . Many brands make them to customize your computer and personalize it. Wow, great hat! I love those and have a beautiful turquoise one (hm, perhaps I ought not have told you…!). It comes very much in handy when I’m out and about in the summer, my being so fair-skinned. I’m sure you love yours! 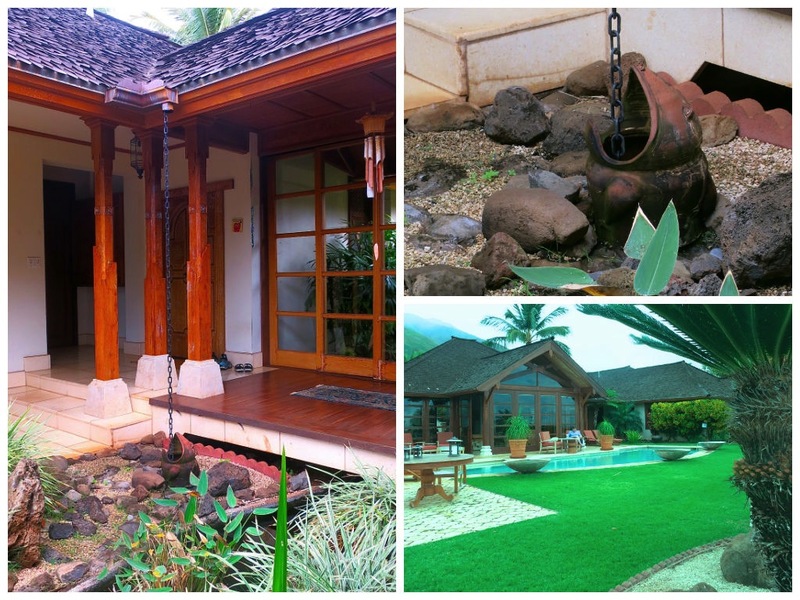 The rain chain/water catcher is a marvellous idea, and very pretty too—I like its whimsy. I’ll have to keep my eyes open for things like that locally! Thanks so much Jen, I would love to see you model your turquoise number…maybe next to a cool vintage car? I took more pictures from around the B&B, it’s a very unique place. Truly one of a kind. I’ll post along the way. The one bad thing was their internet didn’t work well at all. It took a really really long time just to bring up my blog. I think it wouldn’t be to hard to make a rain chain and terminate it in a nice clay urn you love but it’d probably have to be custom made since you’d never find it at Home Depot or Lowes.Cheers my dear. Ah, what a gorgeous location you visited! And, you hat?? Holy!! It’s huge, I love it! Move over Diana Ross!!! It really is giant, Ha! I just fell for it and didn’t want to regret walking away without it. Has that ever happened to you? You see something you love and think, “well I shouldn’t, it’s entirely not practically, or I don’t NEED it” and then of course you regret it? I’m going to need a BIG closet in our new home LOL, HA! Love the design of that rain chain, so cute. Thanks so much Sheryl, I’m thinking I’ll get all kinds of attention in Edmonton, LOL. I’ll probably just save it for posh summer BBQs or lunch’s out and holidays. The rain chain is really very charming isn’t it? I’ve seen chains before but never terminating in a nice pot. Something to think about on a garden shed or something. Wonderful hat! Looks like you are having a great time. JEALOUS! I love, love, love that hat. Wow! I’ve never seen anything like it. Looks like you had a grand old time on your rainy day in Maui. Everything is so lush and green. I’ve seen rain catchers, but never one that drained into a cute frog. Clever. I can tell by the long view of the place, that the owners have taste and talent to spare. What a gorgeous place to hang out. I enlarged all the pics so I could get a close up look. My favorite of all is the one of you sitting on the grass. You look like a 30 year old starlet on break from shooting her latest pic. Thanks for sharing your day with us. Smiling, smiling. (((( sweet Alys )))), but this hat creates it’s own photo perfect face shade, LOL 30 sounds great though 😀 You’re so cute. Wow! Built and shipped from overseas. Isn’t that something. Our home in Canada was factory built, but not from that great a distance. It was a three bedroom, one bath with a living room and kitchen. Nothing fancy, but it was home. We had a full basement and a big lot. My parents paid $17,000 for it. Can you imagine? I hope to hear more about the fabulous beach house. I bet your happy to be resting in your own bed and seeing your kitties. Those are the things I miss the most when I’m away. Can you imagine families making due with 1 bathroom now. Some homes we’ve seen have 3 full bathrooms and a 1/2 suite too. We only had one bathroom in the house I grew up in too. Patients was a virtue. Sounds like your home was very typical of the time. Now you can barely get a car for the $$. I took lots of pictures of the B&B but had no time to do any fun stuff today after laundry, cleaning and unpacking. We also had to go for groceries as our cupboards were empty. I know, right? And one bathroom was a *huge* improvement on the outhouse…or the chamber pot. Ah…poor kitties. They must have wondered if you were ever coming back. I often think that when we’re gone for a week. I know they are so glad to have you home. 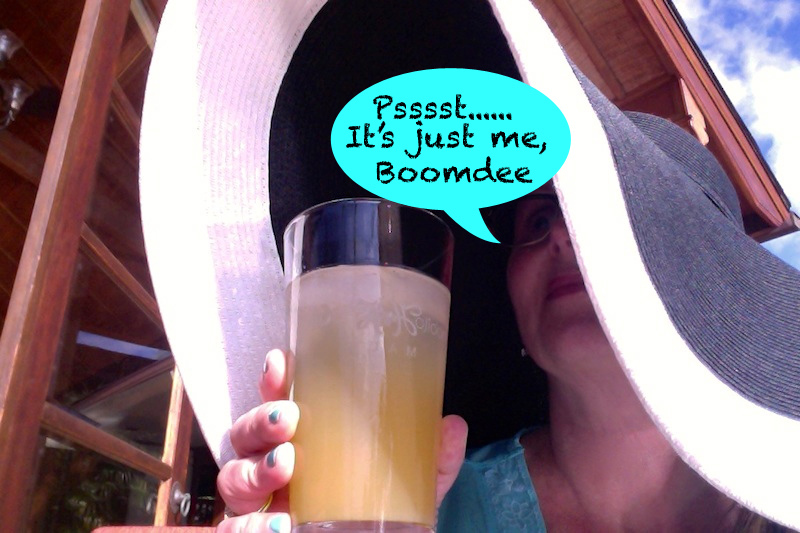 Love the hat Boomdee!!! Where is the aqua colored rose tucked into the brim???? On a rainy day, there’s nothing nicer than chillin’ on a covered porch listening to the rain and taking a day to commune with Mom Nature….sometimes on a vacation it’s nice to just do NOTHING!! Oh I just love that hat! So chic! Hmm, I like to read read read if it rains on my holiday. That or play scrabble. I love Scrabble too, we used to play for ours at the lake. It’d start off as best two out of three and then three out of five…..Have a wonderful day!